The period of 1975-1980 was a critical time for high budgeted science fiction films to be released for the general public. Already, I have touched on Disney’s ‘The Black Hole’ in a separate review, and of course in 1977, George Lucas took a stab himself with an operatic matinee called ‘Star Wars’. ‘Alien’ is no where near either of these films in terms of style or storyline. Actually, this film shows a degree of experimentation in itself as Ridley Scott sought to develop the idea of science fiction by infusing it with the horror genre (which was just reaching it‘s peak at the time). 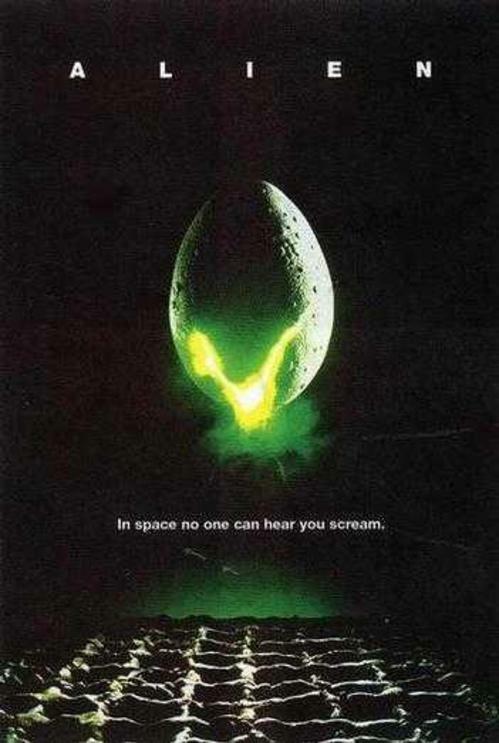 Even it’s own release trailer, with no speech and distressing imagery, stating at the end: ‘in space, no-one can hear you scream’ is predominantly seen as a figurehead within Hollywood cinema as both the film and reception are classic examples of a good dynamic idea paying off. ‘Alien’ has a basic and simple concept. A mining vessel lands on a barren moon following their investigation into a distress signal they pick up, unaware that the planet is inhabited by a savage alien race. One of the crew gets infected, impregnated and subsequently dies when an alien blows out of his chest. The Alien begins to kill the crew one by one whilst they try to survive, and in the end, a sole survivor called Ripley ends up being the only one escaping in a lifeboat ship. ‘Alien’ has not only produced disturbing scenes which the average film goer can remember (such as the chestburster scene and Dallas’s death scene), but it has also produced in itself a female heroine for the film industry in the shape of Lt Ripley, a character which subsequently returned for three more sequels. It was originally intended to be a male character, but due to the fluxing ideas of Hollywood the character was eventually changed into a female lead. Also having Ripley as the female lead also shows a more direct and dynamic idea towards society and stereotypes due to the fact that as a feeble woman she is the only one who survives in a crew of mostly athletic men. Looking at the film in its technical aspect, ‘Alien’ is no doubt tense in places and builds up the death of each characters in an operatic fashion as they are all basically trapped in an enclosed space. The special effects are, yet again, of their time but were eventually re-looked at when Ridley Scott directed the 2003 re-cut of the film. The casting of each actor to character fits and flows like a well oiled engine, and the scenery in some places is just incredible (especially since most sets were miniature scaled). In fairness, it’s a film which ends up making you feel satisfied, if not wanting to see more blood, screaming and action. It’s a film that basically utilises the viewer’s own terror through their own fear of being dark and alone, isolated from natural society. ’Alien’ in my view is enjoyable to watch even if you don’t like science-fiction. In my opinion, it is well worth the £5 which it usually sells for in any DVD store at present, like HMV, and a pure, good example of how successful the science-fiction horror genre has been (which nowadays is somewhat becoming a dead horse).